drops little treasures my way (lardo, pancetta, and guanciale…oh my!). was making me lose sleep. never sure just how fresh those vacuum sealed packs are. So, what is a girl to do? one that a good snug fit for the eggs). Wait until the butter froths and the froth then subsides. 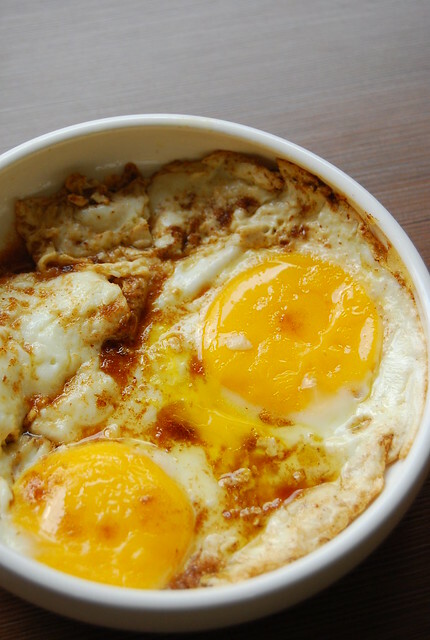 a runny yolk…always) slide the egg and anchovy butter onto a shallow bowl. Enjoy immediately! supermarket…even the small cheapy non-stick skillet! taste…you can always add more if you’d like it to be saltier. great weekend, a happy Halloween, and fabulous breakfasts – ghetto or otherwise! My breakfast was taho. I'm hungry again—perhaps it's time for second breakfast? We've butter, anchovies and eggs in the fridge. Oh, I love the idea of anchovy butter (anchovy anything). I've never had bottarga (price tag, as you say) but it's great to know this is a substitute! This sounds just wonderful! I love the idea of the salty anchovies with the creamy, runny egg yolk. OMG, as long as a dish involves anchovy, sign me up! Hahaha! Damn, it ain't breakfast again…oh wait, I am having this for dinner! I've only had anchovies with pasta – never had it with eggs, but this looks yummy and simple to make! bottarga is light years away from zamboanga but we do have anchovies which i'd like to "swish and flick" over the eggs soon. i was going to say 'rustic' but i like your word 'ghetto' more. hahaha! Oooooh, this is good and bad at the same time. Thanks for sharing! I wish to try this for myself! Hi Arlu! He is! 🙂 Check out his blog if you want droll-worthy restaurant meals! Hi Midge! What a lovely memory 🙂 I'm sure duck eggs would make this even more decadent! Is there any other way to cook an egg than in butter?! Your photos are stunning! Yum. Yum, yum, yum!!! I was full, but my mouth watered looking at this photo! YUM! I am partial to anchovies, but not many love them or include them in breakfast. My favorite brunch spot in Brooklyn makes incredible breakfast bread pudding with anchovies – its one of the best places to eat in New York – and it reminds me of this! delish! Thanks for sharing. I LOVE bottarga too! (Have you tried the bottarga pasta at Mamou? My only complaint is I wish it had much more bottarga.) I never would've thought to substitute anchovies for that — brilliant! And anchovies are a staple in my cupboard! Plus, of course, I always have butter. So I could do this tomorrow, if I wanted to. 😀 (Not right now, because I'd have to buy eggs.) I'm going to do this soon, for sure. Easy (except for the sputtering part…that's kinda scary for me), quick and delicious — right up my alley! Salivating as I read your post! This looks so delicious!! I love eggs and anchovies (separately) and now you put them together and I will definitely cook this for my breakfast tomorrow. Thanks for sharing! Hi Social Chef! Thank you!